C.P. Seven Eleven Public Company Limited (CP7) commenced trading on the Stock Exchange of Thailand on October 14, 2003. 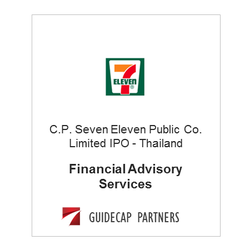 CP7 operates convenience store retail outlets under an area licensing agreement from 7-Eleven, Inc.
​GuideCap Partners provided financial advisory services to 7-Eleven, Inc. in connection with the offering.